Bon Macaron Patisserie has gained a cult following in Victoria, BC since opening there in 2013. It will launch two new locations in Vancouver this month: a Kitsilano patisserie opens August 8th, and a Granville Island storefront will open its doors soon after. Owners David Boetti and Yann Fougere, both French, met at university in the South of France and later moved to BC, where Fougere completed his degree at University of Victoria’s prestigious Peter B. Gustavson School of Business. After working at several bakeries in Victoria—Fougere was manager at the iconic Murchie’s for four years—the friends opened a patisserie dedicated to macarons, the colourful, delectable confection now hugely popular around the world. Boetti and Fougere create an inventive and constantly expanding array of sweet and savoury macarons. They serve an appreciative market at scales ranging from single macarons to full weddings, with presentation options that include striking macaron cakes and towers. Macarons are always gluten-free, and dairy-free are versions available, making them the perfect treat for any group or scenario. Bon Macaron Patisserie has earned its many fans by adhering to the highest standards of quality in ingredients, preparation, and service, and by developing strong community ties through working extensively with local producers and charities. These standards will be carried over to Vancouver, where new flavours will regularly be created using ingredients sourced directly from the Granville Island Public Market. 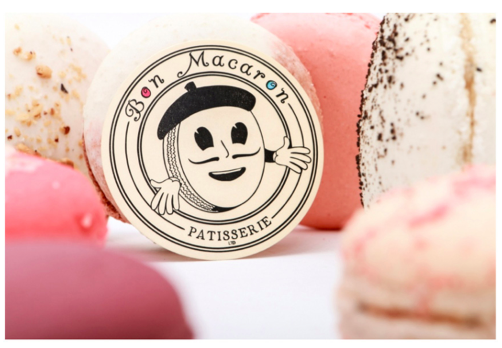 A winning fusion of French tradition and West Coast freshness and ingenuity, Bon Macaron is set to make a delicious, multi-coloured, multi-flavoured splash in Vancouver’s internationally renowned food scene. Gary and Taya Ng are the Founders of Eating In Vancouver & the World. This husband and wife team search for the best dining experiences - including restaurant launches, new menu tastings and culinary events. Learn more about the couple here and connect with them on Twitter and Facebook. Subscribe to our RSS feed and social media streams to receive updates.